Despite a swarm of internal contradictions, a nonviolent Thanksgiving is possible. In the United States the Thanksgiving holiday is upon us, which gets me to thinking: What would a nonviolent thanksgiving look like? Naturally, I Google “thanksgiving” and “nonviolence” and get a spate of web pages promoting tofurkey. (There seems to be an organized campaign afoot this year to get as many letters to the editor into local newspapers beginning with the words, “With his recent re-election, President Obama has won the power to pardon more turkeys on Thanksgiving,” and then urging readers to do likewise.) 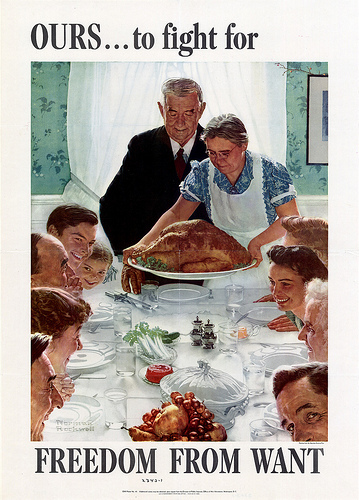 Nonviolent Thanksgiving would, no doubt, be served by a general amnesty to hundreds of millions of turkeys. But I suspect that even more is possible. It might first help to think about holidays in general. Holidays seem straightforward enough — days set aside annually to mark something significant. There is little, though, that’s simple about them. Over generations and sometimes centuries each culture churns away at its own kind of spangled time machine and sprinkles the year with commemorations, solemnities and long weekends. The festivities that emerge — and those that are left out — reveal much about particular societies and their proclivities. A warlike society, for example, will have its fill of memorial days strewn across the calendar — moments that not only commemorate but, subtly or not, reproduce the tendency toward war-making. Cultures make holidays. But holidays also, as this case suggests, help make cultures. Culture-making is not easy. It often results from colliding histories and perspectives. Holidays are similarly liable to carrying this kind of conflicted and ambiguous baggage below the surface — or out in the open. Thanksgiving is this kind of convoluted holiday. When Vanessa Ortiz wrote about Thanksgiving in 2011, she smoked out a number of these interwoven, countervailing realities. It’s a harvest festival. An emblem of invasion, occupation, and genocide. A public acknowledgment of divine goodness. A consumerist binge. A mythic meal. A prelude to — and now, in some places, the first stage of — Black Friday. A prayer expressing gratitude. An avalanche of football. And then, of course, all those turkeys. Historian of religions Dell de Chant sharpens this picture by depicting Thanksgiving as one of the holy days of capitalist civil religion whose spirituality is “production, consumption and disposal” and whose god is Santa Claus. Despite this swarm of internal contradictions, however, I believe a Nonviolent Thanksgiving is possible. A Nonviolent Thanksgiving would include recovering the heart of the ancient practice of celebrating the harvest and other events that strengthened the community’s well-being. Thanksgiving festivals traditionally were ways of responding to matters of life and death. Nonviolent Thanksgiving would reclaim this spirit by opening public space for expressing soulful gratefulness for the transient beauty of this world and for taking action together rooted in this spirit of gratitude. It could adapt the contemporary Thanksgiving fixtures to the crises of our time — for example, preparing Thanksgiving dinner for hundreds of people who would otherwise go hungry in a public space where this is prohibited (like some of us did when we created a lavish banquet for 800 homeless sisters and brothers in San Francisco’s Civic Center Plaza, where the city had been arresting anyone serving food in public to the homeless). Or, since it is a public holiday, it could become a day of mass action focused on a wide range of social crises, with potentially millions of people off work to pitch in. Expressing and cultivating our profound gratefulness for all — for those closest to us, for all other beings and for the earth — Nonviolent Thanksgiving could be a time of training, community building and action, just as the Indigenous Peoples’ Sunrise Ceremony has been taking action since 1975 at Alcatraz Island on Thanksgiving morning. Nonviolent Thanksgiving then could join Dr. King’s birthday and the International Day of Peace — along with a reclaimed Mother’s Day for Peace and Gandhi’s birthday — in accelerating the creation of an annual cycle of peace and justice holidays. Nonviolent Thanksgiving, one day, might exist on a national or international scale. But do I really need to wait until some new calendar has been stitched together? For now, I’m thinking of getting it rolling closer to home. After all, today is Thanksgiving Day; maybe I can make it a bit more nonviolent. One nice, first step is to call to mind a handful of agents of nonviolent change for whom I am deeply grateful. There are so many folks — far more than I can list here — but I first think of Louie Vitale. I am so grateful for my 80-year-old co-worker who went out to Vandeberg Air Force Base north of Santa Barbara, Calif., last week and, by himself, crossed the line and was arrested just before a Minuteman intercontinental ballistic missile was launched across the Pacific, landing in the much-blasted Kwajalein Islands. There was something so moving about his willingness to do this alone, without a crowd’s fanfare. I am grateful for Kathy Kelly, who has made innumerable trips to Afghanistan, Pakistan and Iraq to relieve suffering, enhance potential, and walk side by side with those under drone hellfire. I am grateful for Jack Healey, who has spent his life tenaciously struggling for human rights and, over the past 13 years, working for freedom for Aung San Suu Kyi and the Burmese people. I am grateful for Veronica Pelicaric, who has courageously traveled the world bringing the light of nonviolence. I am grateful for Brian Terrell, who is about to head to federal prison for six months for his nonviolent protest against drones. I am grateful to my friend Alfredo Gomez-Beloz, a guitarist, ethno-botanist extraordinaire and community gardener. I am grateful for Leah Toyomi, my three-year-old daughter, who constantly teaches me the power of creativity and nonviolent resistance. I am grateful for so many more than are named here, the ever expanding circle of friends and mentors, living and dead, whose example and spirit have strengthened so many of us. We each have this kind of list. I invite you, today, to get out a piece of paper and jot a few of the names down. As you bring them to mind, let the radiant light of nonviolence shine into all the corners of this wounded and sacred world. And, if you like, ruminate on the possibility of Nonviolent Thanksgiving Day becoming a reality as one small dimension of making a more just and peaceful culture. I love the idea of giant, civilly disobedient meals. Jesus – who, lest we forget, was one of history’s great nonviolent resisters – understood the transformative value of mass meals, meals that transgressed hardened social norms of cleanness and uncleanness, male and female, Jew and Gentile, meals that opened up possibilities for people to share despite their differences. I don’t think it’s a coincidence that one of the ways he described the Kingdom of God was as a “great banquet” (Luke 14). Keep up the good work. Agreed! The relevance of this sort of action is becoming greater and greater, as more and more cities are adopting this kind of legislation restricting public feeding. I believe Philadelphia and Houston have done so. I don’t think a lot of things that are touted as being nonviolent are really so nonviolent. If you look at the historical photobombing of violence upon violence that Christianity has done throughout the history, it is pretty well a prima facie necessity to forward the hypothesis that there is considerable violence at work in Christianity. In its core teachings, there are terms and procedures which are, while lacking outward violence, basically riddled with immense violence, extremism, stunning and breathtaking force, blindness and cruelty. I do not buy the story you are telling here. I hope you had a nice Thanksgiving. Many did not. Is it violent for me to offer this disagreement? I don’t abide by the usual cant that all religion is really the same, that it doesn’t have violence in it, whichever religion one wishes to mention. I hold with Gandhiji that whatever religious teacher shows him or herself not really to hold nonviolence as a highest thing, I will not follow them and will hold to nonviolence primarily. I am given in conscience — but not forcience — to say this. I am sorry if it offends. A day made unique to you and those around you, an evolving holiday for gatherings or solitude, kept free of commercialism, holding and sharing of benevolent principles, and anything else having these qualities. A quiet day for reflection, contemplation, and determination. Thanks for this great reflection on Thanksgiving. I also took a look at the holiday anew this year, as I spent it in Kyoto, Japan. Wanting to celebrate, I invited all my friends to a meal. As I was the only American in attendance, I had to explain the holiday to everyone. As I was doing so, I reflected that the way we now celebrate it has little to do with its origins. With my friends from various countries, we all took turns thinking about the past year and sharing what we are most grateful for. It had special meaning because a year ago, we were a bunch of strangers who had all come to a strange land for the first time. Now, we are a multinational, multicultural family, able to come together and break bread. It was a great Thanksgiving. Pr. Butigan, I am a former student of yours and I am grateful for you and all the other PAX professors at DePaul University for all that you taught me during my undergraduate studies.